Vinoteca – A bustling, chaotic, pretty much disorganized wine bar that, almost magically, actually seems to be organized when one is a customer. They serve people sitting, standing, bar-leaning, and shopping in what seems an utterly chaotic and random way. But serve them they do. On offer are a fairly mediocre list of wines by the glass in the midst of a pretty wide-ranging wall selection of wines by the bottle. I don’t try the food, as I’m on my way to dinner, but I suspect the trick here is to plan the liquid capacity of your group carefully, so that you may order by the bottle rather than the glass. That said, they’re friendly and receptive to banter, even in the midst of a crushing post-work rush. Really, this isn’t a “wine bar,” this is a neighborhood bar that happens to serve wine and be awfully well-known. And that’s not so bad. St. John – A place that probably needs little introduction to the carnivorous, the nose-to-tail ethos is not overwhelmingly in evidence on my menu tonight. Or maybe I’m already a quarter of the way in from each end, and it’s just the stuff in the middle that I’ve yet to 100% embrace. But to be honest, tonight’s carte is pretty staid, vs. my expectations. And yet, those expectations include a determination that I will push my boundaries a bit. So, rather than the infamously delicious marrow that I’d usually order, I opt for sea urchins. 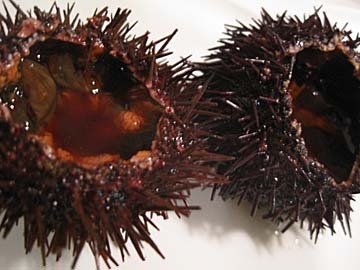 Now, I eat their roe all the time in Japanese, Italian, and other sorts of places, but the slashed-open entirety of these spiky little sea aliens are a new experience for me. New, and delicious. All the briny liquidity that makes a carefully-shucked oyster such an exercise in perfection is, more delicately, displayed here. After that, my cream-stew-ish dish of some sort of heirloom pork is perfectly tasty but pretty standard and straightforward. The chocolate terrine that follows, however, is stunning…and even more so with the incredibly rich Armagnac ice cream that accompanies it. There’s a vieille prune and an excellent coffee somewhere in this quadrant of the evening, but honestly I’m meated and wined into fair, albeit happy, oblivion. The atmosphere is gymnasium chic, the service is quick, the overall experience is pack-‘em-in and move-‘em-out. And everyone loves it. This is a great, great restaurant. 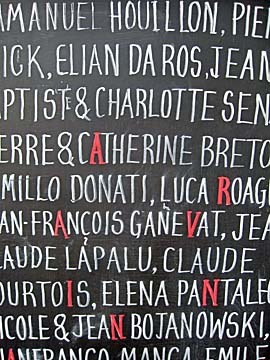 Terroirs – Apparently, every major city must have a wine bar carrying this name, with or without the trailing pluralization. This one was a little more groundbreaking than some of its namesakes, shaking up one of the most established wine cultures in the world with naturalia and a passel of its qualitative cousins. The menu’s perfect for a sort of place in which one wants (or should want) to sample and graze both solids and liquids. I make it simple on myself, in conception if not quantity, by assembling an array of charcuterie from the Pyrénées, radishes with anchoiade (the only failed dish I’ll order; the sauce is gelatinous and obliterates the delicate radishes), and cod roe with egg. The bread’s good, too, and given what I’ve ordered I end up with rather a quantity of delicious cornichons, which are about as sharp a palate-clearer as one can find. Hot Stuff – Exactly the sort of downmarket curry joint one wants. We, as is recommended, just let them feed us. And it’s good. Very good. And stupidly cheap (for London). We – the other party to which I keep referring is London-based wine writer and Barbera 7 co-conspirator Stuart George – bring wine, of course. Rasoi – I’ve done upscale Thai, and now here’s upscale Indian. It’s not quite as overtly striving as was nahm, until the plates arrive. This is decorative, modernized, Westernized Indian food in presentation and, on occasion, in ingredients. But not, I’d say, in flavor, which is just as rich and complex as one expects. Service is more the upscale norm, and there’s a quite fine wine list to match (if anything actually matches Indian cuisine). I had my doubts about this concept, unsure if the soul of the food would survive the upscaling, but I needn’t have worried. This is a vibrant success. Maze – My dining companion is unwell. Exceedingly unwell, in fact. Against our better judgment, we go ahead and attempt to keep this (sometimes difficult) reservation, made ages ago and reconfirmed twice. It might be our only chance. As soon as we walk in, I know we’ve erred. We order a few small plates, hedging our bets despite the increasingly green face across from me. Fifteen minutes later, we’re out the door. In an act of kind generosity, they rebook us for two nights hence. In between the greenness and the hasty departure, here’s a bit of an aborted mini-meal on my part, which I scarf while paying the check and hastily draining a few glasses of already-delivered wine. The delicious-sounding poached duck egg with Jerusalem artichoke velouté and a persillade of porcini (which initially presents itself, somewhat unfortunately, as a giant bowl of foam) is terrific at bite one, tedious by bite four. There’s no balance here, just incredible richness. I like richness, a lot, but there’s no respite, and this dish needs one. On the other hand, there’s also tea-smoked salmon with cauliflower, radishes, and apple vinaigrette. Here’s all the spare crispness that the other dish lacks as its counterpoint. The flavors are clearly delineated, though of course a plate like this relies much more on quality shopping than it does on high-skill kitchen techniques. A few nights later, take two. More small plates to start, this time starting with a rabbit and foie gras terrine with accompaniments from both the porcine and dried plum genres. It’s very good, if just a touch dry. Next are quail, kohlrabi, and cauliflower with the spice of the souq and a burnt onion reduction. The combination is extremely flavorful, but suffers from the same issue as the poached egg: too many intense flavors in the same narrow band, which ends up (due to a longer-lingering aftertaste) being dominated by the onion char. Even the kohlrabi doesn’t help. Again, it would be preferable in a smaller quantity than is offered here, and this isn’t exactly a big plate. The only unmitigated brilliant dish I’ll have here is the next: daurade atop squid Bolognese and garlic, with some sort of citrusy counterpoint and a lump of chorizo. The squid Bolognese is a brilliant idea, frankly, bringing land and sea together, and though I’d have preferred better integration of the chorizo into the dish, everything works in both isolation and tandem. After this, the better-sounding (on the menu, anyway) pork cheek and belly mini-choucroute is a bit of a letdown. I expect the choucroute concept to be taken somewhere individualistic, but other than the meats used, it’s really not. I like choucroute, and I like this. But I wouldn’t have to come to a Gordon Ramsay restaurant and pay this much to get one I like equally well, and this isn’t exactly an Alsatian-sized portion. Rice pudding with mirabelle finishes. It’s quite fine, but at this point I’m suffering from a bit of palate fatigue, so I’m not sure my faculties are in session. Rereading the above, I see more carping than the restaurant really deserves. It’s good, service is attentive if a touch quick (they turn tables here, and it’s a huge restaurant with a lot of ground to cover), and while it’s expensive it’s not larcenous. But it is not, to borrow the Michelin parlance, worth a special trip. It’s more an “if you’re in the neighborhood” place…though it’s not a bad neighborhood to be in, for sure. As for the wine list, it holds quality options for both conservative label-drinkers and wild-haired seekers of the alternative (naturalia, not so much), with the former of course being soaked for the maximum number of pounds, and the latter getting the better end of the deal. In other words, the normal state of affairs. Special note goes out to a more than decent by-the-glass selection. nahm – Upscale Thai. I know this exists in the States, here and there, but I’ve never heard anyone get particularly passionate about it. The Thai that foodish ’merican people love, in its restaurant form, is downscale, or at least midscale. And there is, of course, the plethorama of goopy, Americanized Thai places with the four-color-curry pick-your-meat menus, at which everything after the coconut soup is more or less a disaster. Not here, though. David Thompson’s beautiful boutique hotel restaurant is as classy as any joint, albeit with a bit more wood-toned warmth. (Caveat: the music is excruciating elevator world-jazz, but no one’s perfect.) As for the service, it’s efficient more than warm. Normally, I would prefer this, but part of the game this restaurant plays is that there’s no hand-holding…you’re expected to know, or to not know and guess, rather than be gently guided through a menu that will, for non-Thai-fanatics, be largely unfamiliar…and one can always feel somewhat at sea aboard the truly unfamiliar. In any case, if there’s a question of construction or detail, there’s always Thompson’s parenthetically exhaustive, obsessively pedantic, and fussily brilliant cookbook. I’ve been warned off the tasting menu, which would be my usual choice at such an establishment, by my frequent-guest dining companion as it apparently over-relies on dessert…rarely the strength of an Asian menu. So we trade off a hand’s worth of choices (i.e. five), covering what feels like a pretty wide range of styles. And wide-ranging is what we get. First, the crusty caramelized chicken hash (I don’t have a better way to familiarize it) on sliced fruit that serves as an amuse. Then, pigeon larp with thinly-sliced bitter melon, bracingly scudded and about as far outside Western flavor norms as anything I’ve ever eaten. It’s very difficult to eat, to be honest, and yet it’s so different that the intellectual exercise is enjoyable in its own right. (The post-larp burn, however, is a companion for the rest of the night and well into the next afternoon.) Squid with snow peas, each black with the former’s ink, is so much more delicate than what’s preceded it, and perfectly cooked to two entirely different textures. A pair of soups follow, one a rich oxtail broth that plays familiar Thai melodies in a very rich, almost French-reminiscent broth, the other a frankly brilliant gourd soup that dances a very appealing flavor tango between the familiar and the unusual. Finally, there’s a massaman duck curry rich with what I call “baking spices” in the West – this is as close to dessert as we’ll get – and a clarion combination of briefly-seared venison slices with chiles and other Thai aromatics that cleans everything up and ties off the bow with its precise, almost spare, yet intense flavors. All that sounds good, right? Well, not so much in toto. There are, frankly, way too many flavors in this meal. It’s our fault, not the restaurant’s, but the churning confusion on the palate is very difficult to deal with; rather than the satisfaction of a frontier explored, I’m left with organoleptic disarray, bewildered and a little overwhelmed. Next time, whether or not I choose the tasting menu, I’ll ask for some help with focus and linearity. The wine list is extensive, and appears to be pretty decent (given the sort of food we’re eating, I scan the rich and aromatic whites, make a quick choice, and ignore the rest), albeit quite expensive. What I choose is a cultish Antipodal wine that I never see in the States. The Narrow – Here on a Sunday, with a commanding window view of this fairly slick, newish-feeling (as much as a London neighborhood can be) stretch of the Thames, there’s only one thing to have. Sunday roast? Yes, please. The beef. It’s Denham Vale cowflesh, and it’s really flavorful. As for the overall dish? Well, the thing is, I grew up eating beef (and pork) roasts approaching this quality pretty much every week in my chilly Norwegian-American home, so where for some culinary adventurers this sort of back-to-the-roots cuisine is somewhat of a novelty, for me it’s more akin to familial comfort that most of the locals are undoubtedly experiencing. It was for me, like it probably is for many here, the sort of meat-as-weekend-reward meal that was more special when it was unique, and is now less so in the deluge of carnivorism that makes up the modern Western diet. Though I can guarantee that my grandmother didn’t roast her potatoes in goose fat to an exquisite crunch, as they do here. The gravy’s problematic…a little too rich and reduced for the dish…the parsnips and Savoy cabbage nonentities, but between the potatoes and the mashed swede (that’s rutabaga for those who speak American English), there’s plenty of contrapuntal goodness on the plate, if one considers heavy, starchy things to be the proper counterbalance to sauced meat. Crusting Pipe – An unexpected last-moment connection via social media (thank you, Mark Zuckerberg) leads us here to meet our French family, who have fallen in love with the city of London and on a whim have decided on a serendipitously simultaneous weekend getaway. There’s a somewhat worn but still interesting atmosphere inside despite the dubiously over-touristed Covent Garden location (though I don’t know about the forced entertainment in the courtyard), and a pretty dismal wine list, but I suppose one really isn’t here for the latter as much as the former. I enjoy myself despite what’s in my glass.